There's no doubt Angel Witch were the ultimate hard luck band to come out of the fabled New Wave of British Heavy Metal in the late 70's/early 80's. They were contemporaries of such acts as Iron Maiden, Saxon and Def Leppard. With their melodic but doomy approach to metal, many thought they were the natural successors to Black Sabbath. But poor business decisions, internal disruptions and band leader Kevin Heybourne's getting attacked by a knife-wielding looney all contributed to the gradual dissipation of Angel Witch. Heybourne has never given up the ship, though. He has kept some form of Angel Witch running all this time and for all I know, the band still exists. “Resurrection” is a collection of various demo projects the band has done over the last 15 years or so. Since it’s songs span such a period of time, we find a large cast of musicians spread among them They are Kevin Heybourne, Peter Gordelier:, Spencer Holman, Jon Torres, Tom Hunting andWink Taylor. As to the songs, we have four from a 1987 demo, three tracks from a 1990 session and three from their most recent 1998 demo. Listening to these tracks, I sadly have to say the earlier stuff was better. The 1987 material was a perfect combination of NWOBHM gloom with a thrashier approach. 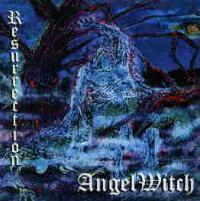 Later projects saw Angel Witch get steadily heavier, with the 1998 material bordering on death metal. It was not an improvement. The group lost some of its trademark melody and Heybourne's vocals, noted for combining sweetness with anger, have markedly deteriorated. Still, this collection is well-worth picking up for an interesting look at one of the NWOBHM's most legendary, if unjustly obscure, acts.. This is pretty hot stuff. It is an excellent combination of a Bay Area thrash sound with the Sabbath/Maiden feel that made Angel Witch so notable. Good gloomy thrash with aggressive yet smooth vocals from Heybourne, this cut was redone in 1990. This is another powerful cut. 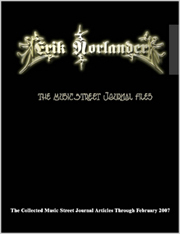 It is not quite as fast as “Psychopathic” and features a bit more of a power metal feel. There is good lead work on this one. Heavy and chunky but somewhat nondescript, this one kind of goes in one ear and out the other. An instrumental, this one is compact and to the point. It starts with some really heavy,more thrash-oriented riffs(a sign of things to come) and then switches into a more measured attack. I would use Savatage as a comparison for this. Catchy and slightly commercial on the chorus, it is typically British metal on the verses. The track is more complex than the earlier stuff and the production makes it heavier. A reworking of the earlier cut, this definitely increases speed and aggression to make it into all-out thrash. The sound quality is improved, yet I still prefer the 1987 version. This is Angel Witch at its best. The speed factor is not as prominent. This is very heavy mid-paced metal with a Sabbath feel but more complex. Great doomy riffs and good lead work make this the album's best cut. Obviously Heybourne was trying to keep up with the times in 1998, as Angel Witch is sporting a much heavier, almost death metal sound. The addition of ex-Exodus drummer Tom Hunting certainly made a difference also. This track appropriately has a “crawling” mid-paced feel. Riffs are the chugga-chugga variety but there's some absolutely awesome doom metal riffs in the middle of this. Heybourne's vocals are not quite the equal of what they used to be. More chugging riffs, almost in a kind of Pantera feel are mixed with typical Angel Witch. This is rather monotonous, really and lacking the melodic approach that identified old Angel Witch. This track finds the band really losing focus with a plodding and dull tune that is not gloomy enough to be true doom metal. There's a stab at a funky kind of approach. Kevin's vocals are just plain bad. All of these factors make this a poor closer to the LP.